Hearthstone is an online collectible card game that requires you to buy more packs with gold or cash in order to enlarge and enrich your card collection. Without increasing your card collection, you will have a hard time making better decks to win more matches and unlock more Hearthstone cards and booster packs. I have already discussed how to grind for gold in Hearthstone to get more packs just from playing and how to earn more experience from your Hearthstone matches. Today I will discuss a strategy I use to buy free Hearthstone card packs with a little extra effort while playing my Hearthstone matches on my PC. What you will need to follow my strategy is an account with MyPoints. MyPoints is a rewards program website where you earn points for doing simple tasks like taking surveys, clicking on advertising emails, shopping through their stores links, or watching videos. The big keys here for the Hearthstone Strategy is taking surveys and watching videos. Most of your first impressions are probably that you want nothing to do with the time required to invest into any video watching or survey taking sites. Let me explain why these are important to this free packs Hearthstone strategy and require very little effort on your part. Hearthstone is a game where you can do absolutely nothing on your opponents turn. That means you are sitting there for minutes at a time doing nothing but watching your opponent make his moves as you wait for your turn to roll back around. Add in opponents that are slow or purposefully stalling and you have a lot of time sunk into playing your matches, Where half the time you are just waiting and doing nothing, you could be earning reward points to convert to gift cards to convert to free Hearthstone cards. That's where the MyPoints site comes in handy. The best thing about the MyPoints site over all kinds of other points earning sites is that their video watching system is able to be used in multiple tabs simultaneously and you don't have to stay within the window to get points for viewing the videos! Anyone who has tried other points reward sites that use video watching for earning points knows many of these sites force you to have to stay on that single video with the volume up or the video will pause itself. The MyPoints video watching system doesn't require volume, can be in multiple tabs at once with various videos playing at the same time, and a single click will auto start the videos so you don't even have to hit a specific play button. 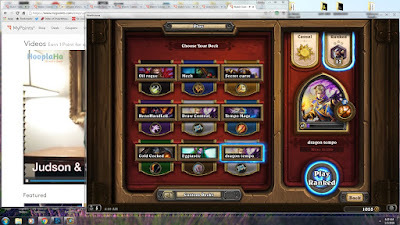 So here is how I set up my Hearthstone session with Mypoints windows running in the background. Below is an image of my desktop as I'm set up to play Hearthstone and earn points during my opponents turns. As you can see in this image, I have the web browser open and in windowed mode in the background with Hearthstone also running in windowed mode in the foreground. This allows me to watch multiple videos for MyPoints credits, while playing Hearthstone. My time is already sunk into the game, so earning points while playing is an added bonus and an efficient use of my opponents turn times! For ease and efficiency, I set the desktop screen up as seen in the above image. You simply click on a video to start it auto-playing in a tab. You don't even have to keep close tabs on the videos to see when they end in each tab, because all you have to look for is the little speaker icon on the individual tabs. When the speaker icon disappears, that means the video has stopped playing and its time to click another video to start the new one running and earning you more points. Some of those gift card options can be used to buy the packs outright or you can hunt for further savings by buying a gift card from one shop and buying the better value card from that vendor. As an example, it can be more efficient to convert to an Amazon or eBay gift card to purchase a cheaper priced iTunes gift card on Amazon or Ebay as opposing to getting the iTunes gift card with your MyPoints. So why just sit there doing nothing while your opponent takes his turn? Put that wasted time to good use and earn yourself some free Hearthstone cards with very little effort! I watch videos and take a few surveys during my Hearthstone play sessions on my PC and in turn I rack in the free and easy to obtain Amazon gift cards, which i turn into iTunes gift cards to get my Hearthstone card packs for a much better value and little to no extra effort. Start Earning Free Hearthstone Cards Too! This strategy works to get all kinds of gift cards for various places. I just like to pair it with Hearthstone since there is a lot of wasted time sitting waiting during your opponents turn. And that time can be converted into $10, $25, and $50 gift cards with little extra effort using the time you've already sunk into the game already. In a normal Hearthstone gaming session I can watch many videos in the multiple tabs I have running and not miss a beat in my Hearthstone match! I also use the same strategy with Swagbucks to earn gift cards - Swagbucks starts you with a free $5 and if you hit 300 Swagbucks in your first 30 days(points worth $3 cash out), they will match you another $3! I've been using Swagbucks a lot recently and the earnings come a lot faster. So I'd definitely sign up for Swagbucks and Bing Rewards, then add MyPoints and InBoxDollars if you are looking to expand into more options for earning money online. Bing Rewards is a super quick and easy program where you can easily earn $5 every 2-3 weeks for just 20 searches a day! I've also recently started with Inbox Dollars, which is a similar program to these other rewards programs. Inbox dollars seems to take the good from Swagbucks and MyPoints and is another easy source for extra online income. I've recently started using Get-Paid as another way to earn income online with little to no work. The tasks and activities at Get-Paid pair well with my ability to complete these tasks and offers while at my normal job. And the tasks to earn come a lot faster and easier than the other main sites, so I'd definitely recommend checking out this site as well. They even offer nice referral rewards for people you may also refer underneath you. Another easy to use earnings site is Gift Hulk, which I've just started using as well.